The Progress-Focused Approach: How to remove a US president? Two steps: 1) impeachment (=formal statement of charges), 2) removal after conviction via legislative vote. When has involuntary removal of a US president happened? It has NEVER happened in US history. When has impeachment happened? Nearly never. Up till now, only two presidents have been impeached: Andrew Johnson and Bill Clinton. Both could finish their terms as president. Two others were almost impeached: Richard Nixon (resigned before he (probably) would be removed) and John Tyler. When can it happen? 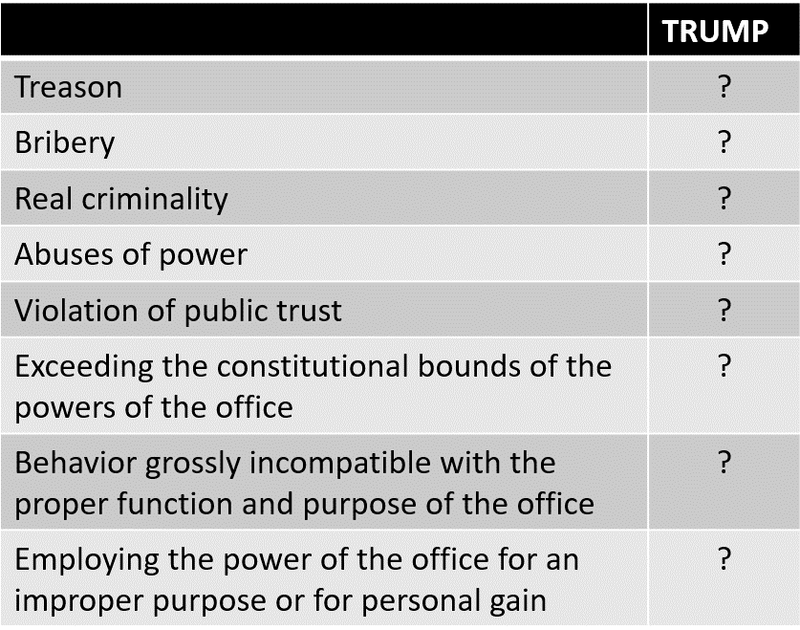 The US Constitution mentions these grounds: 1) treason, 2) bribery, or 3) other high crimes and misdemeanors which can mean: a) real criminality -- breaking a law; b) abuses of power; c) "violation of public trust". 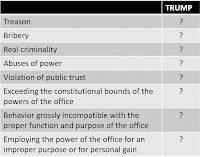 Gerald Ford (1970): three general categories of grounds: 1) Exceeding the constitutional bounds of the powers of the office, 2) Behavior grossly incompatible with the proper function and purpose of the office, 3) Employing the power of the office for an improper purpose or for personal gain. How does it happen? The House first decides if there are grounds to impeach the president, and after it does, the Senate holds a formal impeachment trial. My question: what can citizens do?